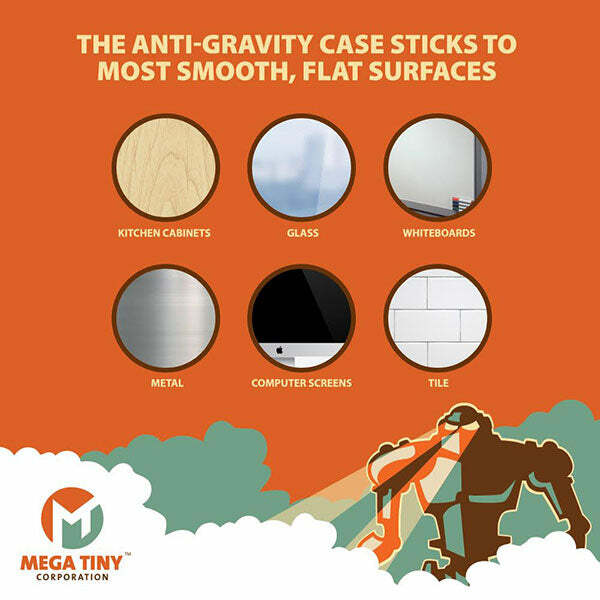 There are types of surfaces you should and shouldn’t stick your Megaverse Anti-Gravity Case to. First and foremost, only stick your Anti-Gravity case to smooth, flat surfaces. Also, when sticking your case to a smooth flat surface, it’s very important to make a firm cross on the screen as shown here and also give the case a little wiggle to make sure it’s secure. Your case should work very well on surfaces like glass, whiteboards, kitchen cabinets, metal, ceramic tiles and more. Some surfaces that we do not recommend using your case on are drywall, concrete, and anything rough in general. The best rule of thumb is that the surface should be completely smooth and flat with no bumps that can be felt to the touch. When used properly, we have no doubt that you will LOVE your Mega Tiny Anti-Gravity Case.